The first time I ever drove a vehicle – one of Fred’s trucks. The wonderful taste of garden fresh cantaloupe and tomatoes from the McPherson’s outstanding garden for dinner each night. The “clean plate club,” of which I was a regular member at meals thanks to Alice’s outstanding cooking. Buying my first real pocketknife, a Buck knife, the “Folding Hunter” model which Alice thought was too big for me but I thought (and Fred approved) was perfect for me. Going with Fred into the garden to pick tomatoes, cantaloupe, squash, okra, and other fresh vegetables in the evenings. Eating WAY too much cheddar cheese from a HUGE block of fresh cheese Alice purchased from a local dairy, and getting VERY sick later that night as a result. Camping at Lake Whitney in their Airstream trailer, playing games in the air conditioning (since it was WAY to hot to spend much time outside during the day) including Skip-Bo. Delivering air conditioners and refrigerators with another boy who was about six years older than me, and running the “tommy lift” on the back of the pickup as we made deliveries around the area. Drinking cold Mountain Dew and eating 3 Musketeers candy bars when we would go on “break” at the store during a summer afternoon. Taking afternoon naps on a couch in the dark, 2nd floor of the hardware store. My biological grandparents, R.D. and Trudy Henley, had been best friends with Fred and Alice ever since they were stationed together as members of the US Army’s signal corps in Oak Ridge, Tennessee, working on the top-secret Manhattan Project as mechanics. Fred was a born “fix-it” man, and following World War II went on to own and operate his own hardware and appliance store in Itasca, Texas, for many years until he finally sold it and retired around 1989. One of the best things my parents have done, relating to Fred and his life, was conduct an oral history interview with him in the fall of 2005 for almost an hour and a half. Fred recounted what it was like to grow up dirt poor in south Texas in the years leading up to World War I, and his experiences living through the depression, World War II, and afterwards. Our family listened to that interview over the car stereo as we drove down to Itasca late Thursday night, and it was just like Fred was in the car with us. The recorded voice of Fred, telling stories from his life, is a priceless gift. Digital storytelling and oral history preservation is something EVERY family should commit to do. As Eric Langhorst challenged listeners in his December 2007 podcast, “Create a Family Memory This Holiday Season,” families have opportunities each holiday season (or whenever a get-together happens) to tell, listen, and record stories from elder members. Thank you, Mom and Dad, for recording and sharing those memories of Fred’s life. Fred, thank you for both sharing them, and more importantly, for CREATING so many wonderful memories for me personally during your long and wonderful life. We’re missing you already, but the memories you’ve given us will last a lifetime. For the first time, digital storytelling has made a significant impact on my life memories — & I have you to thank for this. 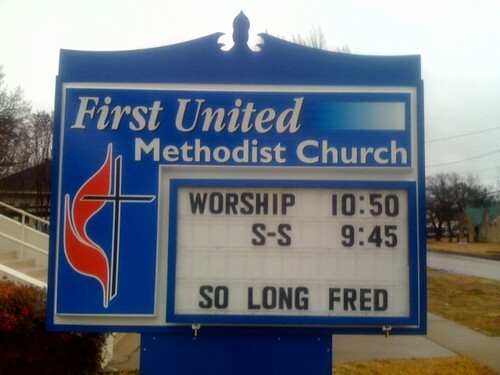 Because of your encouragement back in 2005, we have this wonderful personal telling of dear Fred’s life story. The fact that it’s in his own voice, and that we’re asking the questions that were important to us are all important now. One correction, however: they were no longer in the Signal Corps when they were part of the Manhattan Project. Thank you, thank you for the photos, comments & encouragement! I’m beaming. 🙂 No digital storytelling benchmark is more important than this: Helping preserve and encourage the preservation of memories within our own family. You are, of course, most welcome. And thanks for the correction, too!